The first album from the man who invented and named the music. Hillbilly Rock n' Roll falls somewhere between Fiddlin' John Carson and The Delmore Brothers; Jerry Lee Lewis and Creedence. This is arguably the last roots music. 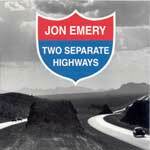 Emery's second album for Bear Family and his first CD contains his first worldwide release "God Don't Ever Change". Highlights include "She Was Bad", "Hold That Train", and "If You Don't Leave Me, I'll Find Somebody Who Will". 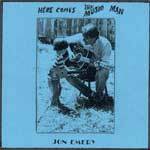 Play "If You Don't Leave Me, I'll Find Somebody Who Will"
After two critically acclaimed Bear Family releases, Jon Emery's first domestic release is a musically diverse CD that deals with the difficulties of relationships gone bad. Songwriting contributors include Emery, Art Blondin, Nick Page and Leroy Preston. Play "The Old Man in the Mirror"
Features "Baby Thinks She's A Train" which went to number one for Roseanne Cash. Guests include Chris Gage, Cornell Hurd, Marty Muse, and Beth Galiger. These are the only Live recordings by the band Ed Ward referred to as "the last Progressive Country band Austin Tx produced". Jon Emery shares the vocals with partner Leroy Preston, formally with Asleep at the Wheel. Emery's first records are all here for the first time. From 1974 in Omaha when he released his first singles, to 1985 when his last single "Beer:30" became a regional hit. Jon's very first recordings happened in 1972-73, when he and his mentor, Bill White, recorded old hillbilly songs they had been performing together. Bill Monroe called Bill White "the best I've heard since Deford Bailey." This is the first volume of a projected 4 volume set. The wonderful book of children's poems by Robert Louis Stevenson have been set to music by Jon Emery. Songs include "The Swing", "The Toy Soldier", and "The Marching Song". For children of all ages. These songs are designed to help your little one's get to sleep. Emery nearly fell asleep during the recording sessions, so we know they work! The idea for these songs came to Emery from children that he sang to over the last ten years. Songs include "Tom the Teddy Bear", "Fireman Jim", and "Go Dog Boogie". Play "Here Comes the Music Man"